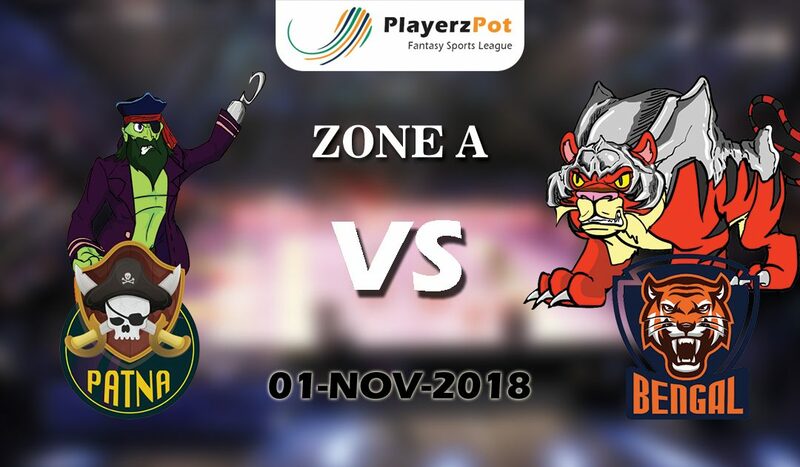 Patna will confront their Zone B rivals, the Bengal team in the last match of the Patna leg at the Patliputra Sports Complex tonight. The Bengal team has fallen short of a win (39-28) against Jaipur in their past experience and would be looking at all 5 from this evening’s match to return to the highest point of the Zone B standings. Bengal has gradually enhanced into a balanced lineup with noteworthy commitments from the attack and the defense. While Maninder Singh has been initiating their attack, commitments from Mahesh Goud and Jang Kun Lee have been fundamental and even predictable. The resistance of the Bengal team, albeit inconsistent, has gradually enhanced their performance and coordination and would hope to tame Pardeep Narwal and his brigade in tonight’s match. Vijin Thangadurai and Manoj Dhull did not perform well in their past match and might be replaced by Ziaur Rahman and Shrikant Tewthia individually. The Patna team would be trying to leave their fans on a high with a win in their last match at home tonight. The injury of Pardeep Narwal, the Patna Captain and star raider, in the match against the Telugu team, had hampered his performance in last evening’s match against the Bengaluru team as he could oversee only 3 raid points from his 12 endeavored attacks. While Deepak Narwal and Manjeet Singh ventured up with Super-10s, they couldn’t hang on their nerves to lose amazingly, one more experience in the last snapshots of the match. The defense tactics of Patna has enhanced match-upon-match, and they have turned into a solid unit with predictable performances from the left corner, Jaideep and the right cover, Vikas Kale. Vikas Jaglan has evolved well this season as a good raider and he would be looked forward to supporting Pardeep Narwal in his tough raids. Pardeep Narwal is the star performer for the Patna team in the raiding division and so far has showcased an excellent form except for one match against the Telegu team. Maninder Singh has been the most remarkable raider for the Bengal squad and has been consistent in his game and scoring patterns. Surjeet Singh has transformed the Bengal’s defense mechanism and has done well to support his team. Vijin has finally got the opportunity to play against the Bengal tonight and will be expected to show an inexplicable game. Jaideep on the left corner for Patna has been consistent player throughout this season. Vijay Malik has been a good investor with his points from both the attacking and raiding division for the Patna team and would be expected to contribute in tonight’s match too. We strongly feel that tonight’s winner of the Pro Kabaddi 2018, Season 6 match between Patna and Bengal would the Patna squad. This Diwali, welcome happiness with PlayerzPot. Click here. Play your favorite game with guarantee winnings. Click Here.